Kalvøy is located just outside Stavanger city center, among the small islands in the city´s archipelago. The island has idyllic green lawns and woods all the way down to the seaside. The silence is only disturbed by birdsong, and you will have a great view of the skyline of the city. At Kalvøy you don´t have to put on skirts or shirt clips, here it is all about human, nature and the experience. 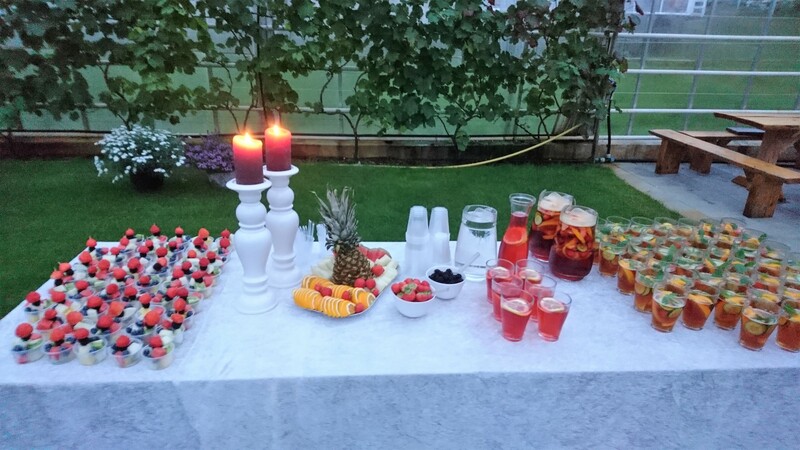 We can offer parties, conferences and activity tours during the day, or as an evening event. All visits must be agreed in advance. Our indoor activitygarden has become more planted throughout the season, and is also great surroundings for a party – as here at a indoor garden-party late in September. "Great facility for prebooked trips"
I addition to large outdoor areas, we have a standard premises for up to 100 persons and 3 cabins for up to 25 persons in each, all of which provide a pleasant atmosphere for the event. We offer both indoor and outdoor activities, on shore and off shore. Additionally we gladly arrange party clerk, a singer or humorist. A day at Kalvøy should be a day of experience! Our main premises has the necessary facilities such as wireless internet, projector, flip-over, sound and microphone. From Kalvøy you are in good position to experience the archipelago of Stavanger from a kayak. Kalvøyparken is host for tours and courses in kayak by Rogaland Aktiv AS. Kayaking from Kalvøy is a unique combination of peaceful waters, rich animallife and skyline view towards Stavanger city center to the west, and Ryfylke´s mountaintops to the east.